I know it seems weird but I never liked Halloween. I wore glasses as a child and always thought I looked silly in a costume. I mean, who ever heard of a bespectacled princess or a ballerina? At some point, Halloween became just another day. Having a child changed all that and I began to embrace the ritual every year. I decorated the house, baked cookies and did my best, considering my crazy work schedule, to outfit my daughter in whatever demon, witch or wizard garb she selected that particular year. The princess or ballerina thing never appealed to her! This year, at sixteen, she remains steadfast in her trick-or-treating tradition, refusing, along with a surprising number of her friends, to give it up and is at this very minute frantically searching for the perfect set of vampire teeth and contact lenses, invented by some clearly twisted individual that will turn her baby blues into something quite other-worldly. 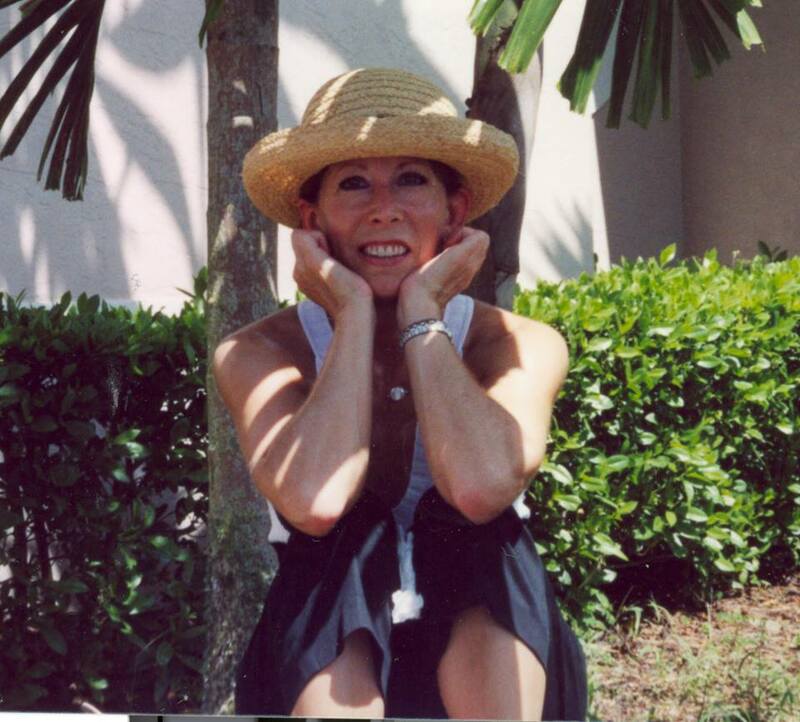 Thanks to my wonderful daughter, I now love Halloween and even though it was ninety degrees today here in Tequesta, Florida, I know it won’t be long before the weather begins to cool. In the meantime, although our leaves are not changing color, it is autumn on the inside of my house with pumpkins and scarecrows strewn about, silk leaf and flower arrangements in the best fall colors, and pumpkin-scented candles that lend a fall fragrance to the air. It’s time to dig out my favorite Halloween CD featuring songs like Monster Mash and Thriller; it’s even time to start planning my Thanksgiving menu but before I do that, I need to bake up some Halloween goodies for my daughter and whoever else I deem “treat” rather than “trick” worthy. 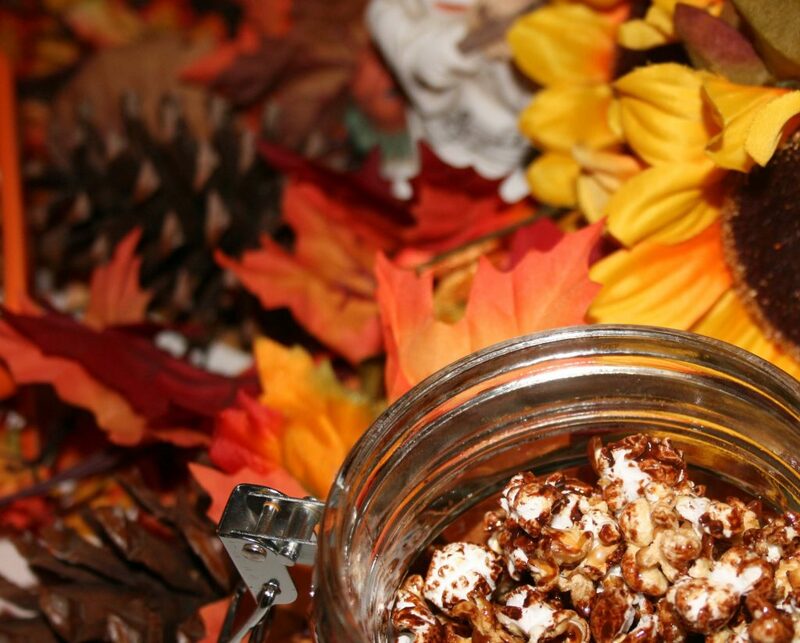 The recipe featured below is the result of a failed attempt to make popcorn balls that were a little less sticky and easier to eat. I quickly learned that the downside of “less sticky” is just that; they don’t stick! Although this popcorn snack may be a second class citizen, and a popcorn ball poser, I still kind of like the taste. I also like the fact that they are made without corn syrup. This particular recipe does not include nuts, not only because my daughter, the purist, turned up her nose when I suggested peanuts or cashews, but also because so many people are allergic to them. Any kind of ingredient may be added; originally, the plan was to sneak healthy ingredients such as flax seed or almonds under cover of the lovely silky drizzle of dark chocolate, so feel free to be creative! Pop the corn. I like to use an air or microwave popper. Any method that doesn’t require oil is preferred. Add popped corn to a large shallow bowl. Add golden syrup to a saucepan and warm it until it is quite liquid-y in appearance. **Temper the egg white with a small amount of the syrup and add to remaining syrup. Use a small ladle to add syrup a bit at a time on to the popcorn to ensure even coating and stir. It will probably be easier to do this in two batches. Should you decide to add nuts, I would recommend adding them to the syrup rather than the popcorn in order to make the nut bits stick to the popcorn and you might want to make more syrup. The pieces should also not be too large. Use a food processer to grind them to a manageable size. Spread the popcorn evenly on the cookie sheets and bake for 60 minutes at 250 degrees. Remove the popcorn from the oven and break up any clumps to allow for more efficient cooling and drying as the popcorn may seem wet. This is an optimum time to add some sea salt if you are fond of the sea salt and chocolate combination; who isn’t??? While the popcorn is cooling, begin to warm the chocolate in 2, 10 or 15 second increments in the microwave. Use a small whisk to stir vigorously and melt away any lumps. Do not continue to microwave unless you are sure it is necessary. Burned chocolate has a very unappealing smell and burned Swiss or Belgian chocolate is just a crying shame. Add your chocolate to a plastic sandwich bag and trim the very tip of the bag. The chocolate may be quite liquid so take care to create only the very smallest of openings. 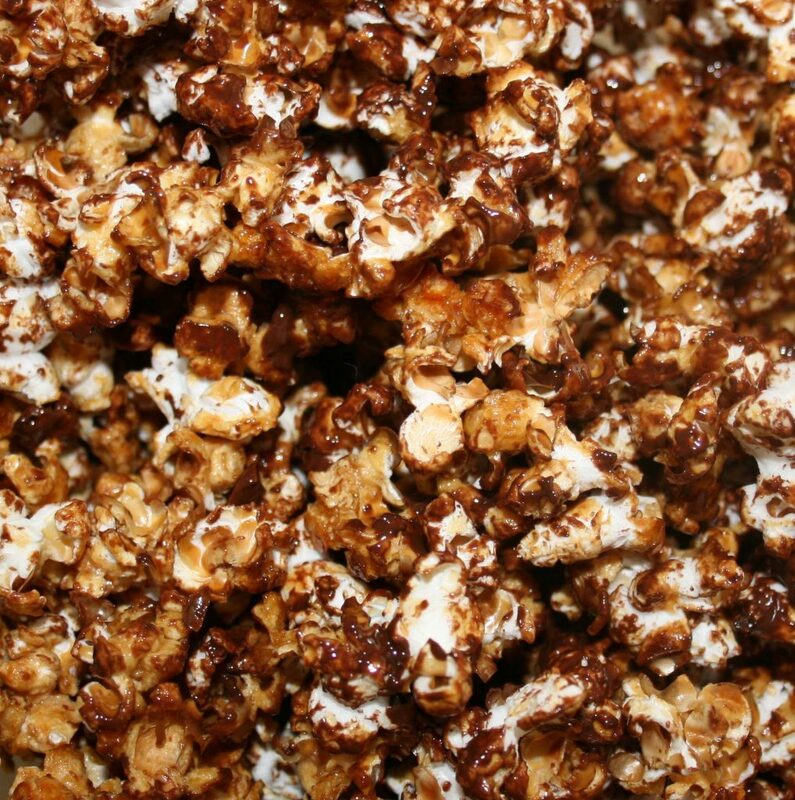 Drizzle the popcorn with the chocolate, stir to coat and allow it to dry. *Golden syrup is an invert sugar made during the process of refining sugar cane. As the name suggests, it is a light amber color and has a unique toasted flavor. Golden syrup may be purchased at Whole Foods Market. **Tempering is an essential process that will prevent the egg white from cooking in the hot liquid. Pour the egg white into a bowl or container. I like to use a liquid measuring cup. It makes pouring easier. Simply add the hot syrup a tablespoon at a time stirring all the while. Eventually, the egg white will be “tempered” and will remain in a liquid state at which point you can add the mixture back to the saucepan.